The Shure QLXD digital wireless systems are available in a variety of configurations that accommodate the needs of live presentation professionals from musicians to business leaders to auctioneers and beyond. This is the QLXD14 system, which includes the QLXD1 body pack transmitter, the QLXD4 digital wireless receiver, the WA305 instrument cable, power supply, 2 AA batteries, two 1/2 wave antennas, 2 BNC cables, zipper bag, 2 BNC bulkhead adapters, rackmount kit, and user guide. 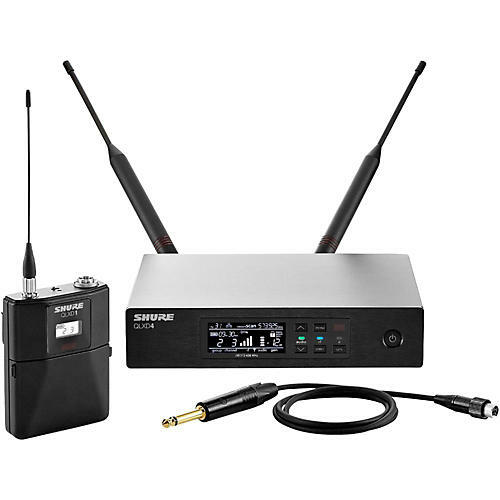 The half-rack QLXD4 Digital Wireless Receiver quickly finds open frequencies and sends them to transmitters via the one-touch sync function. The QLXD4 works with all QLX-D Digital Wireless Systems, and features Ethernet networking and mobile monitoring and control capabilities. QLXD1 Wireless Bodypack Transmitter is a small, lightweight body-worn device that instantly syncs with a wireless receiver over IR at the push of a button and maintains an uninterrupted signal over its entire range. It provides up to 9 hours of continuous use with 2 AA alkaline batteries or up to 10 hours of continuous use with Shure lithium-ion rechargeable batteries.